Well Rushers, Cinderfella is back from the ball. 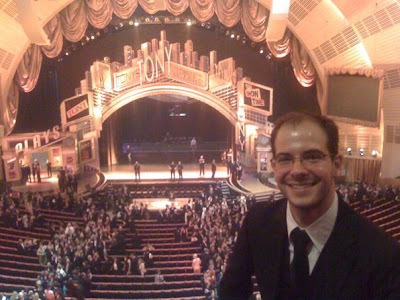 The Tony Awards was a surreal, dreamlike experience, and I realized that sleeping on the street is a small price to pay for amazing memories. Kym, my date, and I arrived at Radio City Music Hall at 6 p.m. We had butterflies in our stomachs and were laughing because it wasn’t like we were nominated or performing. As we lingered around the entrance at 6th Ave and 50th St, trying to figure out how to approach entering, Best Featured Actor in a Play nominee John Glover from Waiting For Godot passed by. We twiddled our thumbs for a few more minutes, waiting to cross paths with more arriving celebrities, but soon decided we better find the commoners entrance and start making our way in. The entrance line for regular ticket holders stretched nearly around the entire block. We waited in line and felt the discriminating eyes of the tourists parked on Rockefeller Center benches meandering over our outfits. As we crawled toward the security check, we saw Heidi Blickenstaff from [title of show], accompanied by Christopher J. Hanke. As we entered the venue, we realized that Heidi had to enter the same way we did—which we felt extremely bad about. The girl was not only in a Tony-nominated show, but she was also Ursula in The Little Mermaid! [title of show] just gets no respect (which we realized again during the ceremony). We flowed into the massive lobby along with many rivers of people. We realized that here there were no border lines between us and the important guests. A minute later, we were standing next to Michael Greif, the Tony-nominated director of Next to Normal. I think the formality of the event helped us restrain from pouncing on him. We also passed Adam Riegler, who was just cast as Pugsley in the upcoming musical version of The Addams Family. We took our seats in the second row mezzanine, dead center. I couldn’t stop marveling at the stage all night. First, Radio City Music Hall is massive (I wouldn’t have known prior to this night—I’ve never been to that dumb Christmas show before). 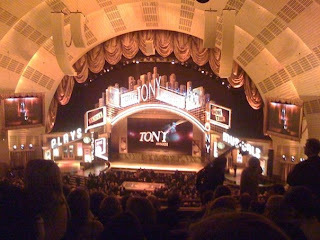 The set of the Tonys, along with the lighting, is a very spectacular, but warm, inviting design. In addition, the use of the new high definition screens make it even more marvelous. Kym and I strained our eyes to the floor sections to recognize the famous faces. There were so many people that it was nearly impossible to pick anyone out. I felt like I was going to get a headache from the visual stimulation. Later in the show, I was able to find where Raul Esparza and Anne Hathaway were sitting. Two of my favorite celebrities of all time, sitting in the same room, visible to me at the same time—incredible. The ceremony was massively entertaining and felt more like a show than I expected it would. It went so fast by sitting in the audience as opposed to watching it on TV. Neil Patrick Harris was definitely a good host and was effective, but his total stage time was so short that I think the awards could do without a host in future years. I most enjoyed witnessing what went on during the commercial breaks. Sometimes there were video packages played, like a humorous commentary montage on Broadway choreographers, or a pseudo teaser trailer for upcoming Broadway shows like The Addams Family. Harris did a couple magic tricks, some of the performances would continue their act after the show was off air, and some bands punched out some mini sets. But sometimes there was no act to watch, and to my surprise, the house remained largely silent. I didn’t even see much mingling between the stars. I think everyone was really respectful of the fact that this was actually a TV set. What was striking us all in the audience (and apparently the rest of the country, from what I’m hearing) was how poor the sound was during the entire show. There was shrill feedback piercing the air, dead mics, and backstage pickup. One of the most shameful moments was when a Tony rep had to run on stage to hand Tituss Burgess a mic mid-performance of the Guys and Dolls production number (“Am I goin’ in with it? I’m goin’, I’m goin’!”). You’d think they’ve done this before! The opening number was fantastic. Seeing crossover between some of the musicals was incredibly exciting because so many of this year’s productions were stellar. And the star power displayed was jaw-dropping: Elton John, Dolly Parton, Liza Minnelli. I discovered that it doesn’t matter whether I’m watching at home or in the audience—I have a gift for looking away when the big moments occur. I actually didn’t see the tremendous Brett Michaels-smashing-into-scenery moment! Stockard Channing came out on stage and my eyes were directed toward her. I guess I was just beguiled again. In case you’re like me and you missed the buzz-worthy moment as well (or, let’s face it, just want to see it again), you can check it out here. Seeing Angela Lansbury win a Tony was a really special moment. Karen Olivo’s acceptance speech was one of the best of the night. Brian Yorkie and Tom Kitt’s win for Best Score for Next to Normal was a huge surprise win against Elton John for Billy Elliot. Kym and I immediately stood up and were screaming along with the rest of the mezzanine when their names were announced—I think it was an unconscious move. And as we were hoping, one of the best moments of the night was when Alice Ripley won the Best Actress in a Musical award for Next to Normal. Although her speech started off a little wacky, it was great to see how touched she was to win, not to mention how gorgeous she looked. And to keep the Next to Normal praises going, their performance was fierce. 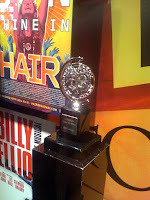 Ultimately, it was Billy Elliot that took the top award over Next to Normal. 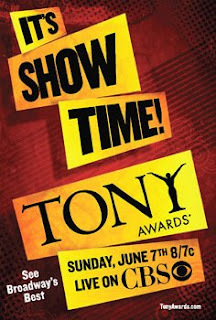 But overall, most shows received at least one Tony, and it seemed appropriate for the recognition to be wide spread for one of the strongest theater seasons we’ve seen in years. Although the stars might have been itching for the show to end so that they could get to their after parties, I wanted to stay as long as possible. Leaving such a special night was difficult. Every stage of the night was punctuated by something notable. On our way out, we walked behind Shrek the Musical‘s Christopher Sieber. Watching the show from my futon next year just isn’t going to cut it.